Note the new 10 second GPP identity sequence / race preview clip! 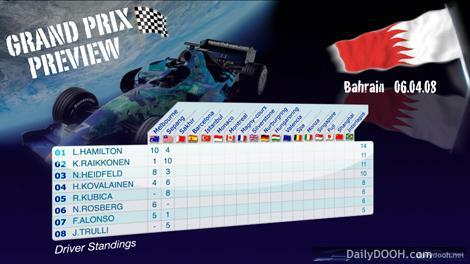 Distribution for the Bahrain Grand Prix is all set for Monday 31st March 2008. This entry was posted on Tuesday, March 25th, 2008 at 12:10 @548 and is filed under DailyDOOH.net. You can follow any responses to this entry through the RSS 2.0 feed. You can leave a response, or trackback from your own site.